Here is a map of all lighthouses and lighted buoys (as far as the US and Canadian Coast Guards are concerned, anyway) in the Great Lakes. Thanks much to Josh Stevens, for his early data spelunking and his encouragement. If you like scraping and cleaning up endless PDFs, then this project is for you! 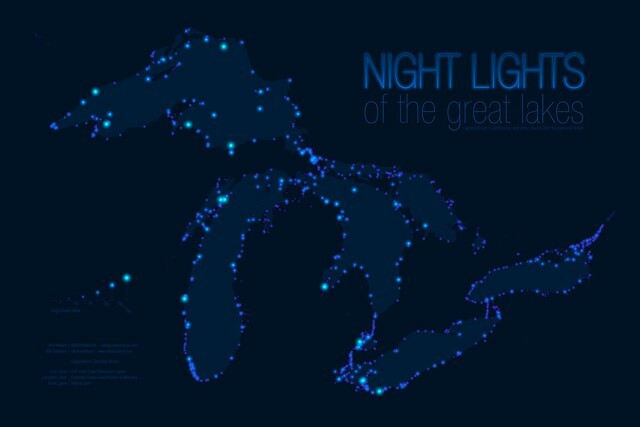 Here is a list of Great Lakes (District 9) lights in US waters. And here are the lights in the territorial waters of our lovely Canadian neighbors. This map was my Mom's idea (I'm not terribly interested in lighthouses, but she suggested it after seeing the earthquake map) and carried with it some kinetic energy. It was slow to start, difficult to stop, and was quite some time in the making and re-making and re-making. I am satisfied to see the results but at the same time a little nostalgic to watch one more living thread that I associate strongly with someone I miss...wind down. But that's life. Pick up a photo print. 100% of profits from its sale are donated to organizations Chris Nelson supported, or organizations that supported her. Starting with Hospice of the Straits. Thanks for the head's up, Brian! I've fixed that. Seems like there's at least one typo in every map!